Get your Hotronix press with the New, Exclusive Lightning Latch - only available on Amazon from Imprintables Warehouse. It used to take 15 minutes and a set of wrenches to change out your lower platen (the deck where you place your items for pressing). With the NEW, Exclusive Lightning Latch, you can now change the lower platen in 15 seconds. NO TOOLS REQUIRED! 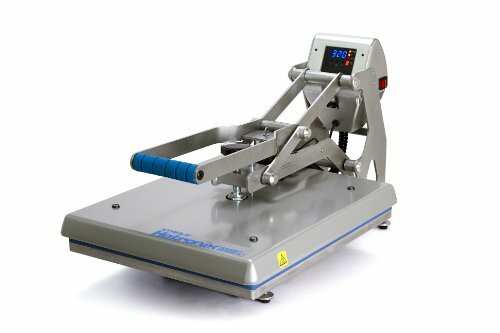 The Hotronix® Auto Open Clam heat presses are lightweight and portable. The magnetic-assisted lockdown, auto-opening feature and digital controls offer unparalleled benefits at an excellent price. Auto Open Clam Heat Press Features:Wide opening for easy layout, Auto sleep mode,Patented Magnetic Assist Lock Down,Patented Magnetic Auto Open,Digital controls for temperature and time with auto release.Patented over the center pressure adjustment Twin TimerTM for programming two independent time settings	3/16" (0.5cm) HRPO laser quality steel framework for seamless technology Auto reset timer and LED readout Digital time, temperature and pressure readout Space-saving clamshell design Built in pressure sensor Floatational heat platen Hotronix® Universal Quality Features: Made in the USA Automatic timer Quick change lower platen Cast-in tubular heating element every 2" (5cm), eliminating cold spots 3/4" (2cm) thick, Teflon® coated upper platen 3/8" (1cm) Silicone rubber bottom pad Push button controls Heavy duty design Scratch-resistant, baken-on powder coat finish Teflon coated heater - stress relieved to prevent warping Optional platens available Platinum RTD heat sensor F° or C° available Temperature range 200°F - 400°F Available in 110V or 220V UL / ULC / CE / RoHS approved Premium warranty New Blue Ribbon Support Access support any time you need it!